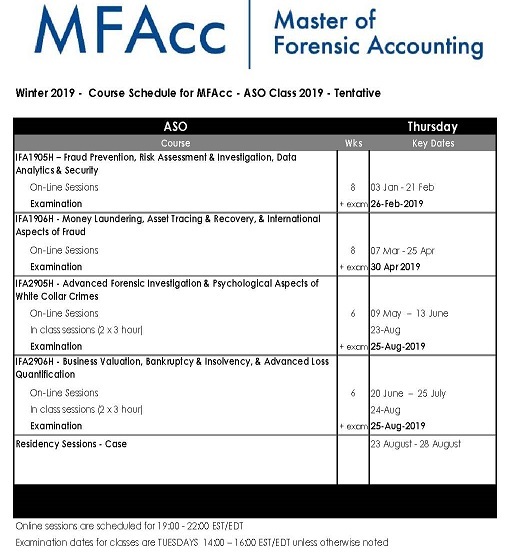 The Master of Forensic Accounting - Advanced Standing Option (ASO) will allow DIFA graduates advanced standing for six of the ten MFAcc courses. This means that if you successfully complete the four new MFAcc courses, and an August residency session in 2018, 2019 or 2020, you will be awarded an MFAcc degree. The University plans to offer the ASO for the final time in 2020. In January 2020, the first course for the ASO program for 2020 will begin - IFA1905H. The four courses will follow one after the other finishing at the residency session in August 2020. Each course will be taught one evening per week, plus the 6-day residency at UTM. In 2020 the classes will be held on Thursday evenings. This is the FINAL offering and the application system will open in September of 2019. The MFAcc - ASO Program is offered by the Institute of Management & Innovation. You must select this as the Gaduate Unit. You will then be able to select the Master of Forensic Accounting - ASO Program, listed as PG MFAC1 as your degree program for Winter 2019. Further instructions will be provided once an applicant registers their application on the on-line system. Once the application is complete, it will be prepared for review. Notice of acceptance into the program will be sent to you mid October. The application for January 2019 is NOW open to DIFA Graduates only!! Applicants applying for admission to the MFAcc - ASO Program must complete the on-line application by October 30, 2018. All applications should be received as early as possible as there is limited space available. Late applications will be accepted on a 'space available' basis only. A fee of $300 is required with the online application submission. Applicants who want to apply for the Master of Forensic Accounting should click on this link - on-line application system. Please choose MFAcc1 for winter 2019.